5th Gen iPods shipping with black sleeve?! Discussion in 'iPod' started by lamina, May 26, 2006. My friend just got his 30gb 5th gen iPod, and it came with a black sleeve, instead of the tan one that the earlier ones came with! Is this new? Has anyone else seen this? Actually I did see this a couple days ago. My friend got an iPod for his birthday - the white one and I noticed that his sleeve was black. I figured since I got the black iPod with a white sleeve that the cases are the opposite colors, but this explains my confusion. I got mine a couple months ago (in white) and it came with a black sleeve. Seems like all the newest packaged iPods are coming with the black sleeves, I guess? Maybe they're doing away with the white sleeves altogether. Not much to see really, but I took a pic. Nice, the white one gets too dirty. yeah,Mine is all dirty,How do you wash your white case. 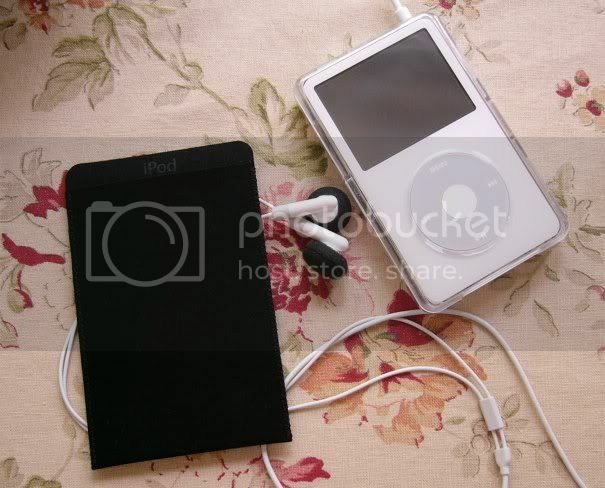 Do some of you use the slip case that came with the iPod as your sole means of protection? You don't use a case or anything else? NO! It scratches the screen, and is too thin. I have the leather case for the 5G iPod. Brilliant quality, but a rip off - costs more than an iPod shuffle! I have a white 60GB and my wife has a black 30GB and we both received the whitish color sleeve with our iPods (mine was ordered the day they were announced and my wife's was ordered in late October). That has 0 functionality . I think that was targeted towards middle-aged people who want to snaz up their tunes. Yup, I use the slip case as the only means of protection for my Nano. It seems to work just fine for me. Like dextertangocci above my worry was that it would scratch the screen over time with fine scratches. Plus I was worried about dropping it so I got a hard case. I'm surprised some people only use the sleeve, but that's cool that it works for you. It would certainly be nice to use it without case. Although on the 30gb my case doesn't make too much of a difference. I can still slip it into my jeans pocket with no problem. Honestly I'm not overly concerned with small scratches on my iPod. I don't view photos or videos on either of my iPods so if small scratches do appear its not a big issue for me. I was wondering the same myself. Anyone have an answer? I'd probably just hand wash it in the sink with some detergent and let it air dry. I'd be worried about putting it through a washing cycle in case the friction undid or loosened the side stitching and the dryer might shrink it.